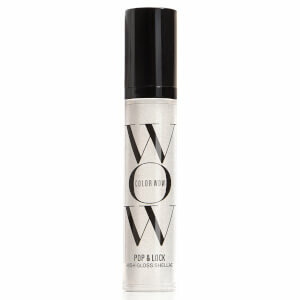 Add mirror-like shine to your style with the travel-sized Color WOW's Pop and Lock Crystallite Shellac; a weightless hair spray that delivers the conditioning benefits of an oil and the radiance-reviving properties of a serum. Suitable for use on wet or dry hair, the clear formula utilises a powerful UV filter to lock in colour and prevent fading, whilst protecting from environmental aggressors that can lead to dullness. Seals cuticles and provides superior hydration to leave locks vibrant, glossy and super soft. Propylene Glycol, Aqua (Water), Cyclopentasiloxane, Hexylene Glycol, Phenyl Trimethicone, Dimethiconol, Polyacrylamide, C13-14 Isoparaffin, Mica, Dmdm Hydantoin, Parfum (Fragrance), Ethylhexyl Methoxycinnamate, Laureth-7, Ci 77891 (Titanium Dioxide), Butylene Glycol, Linalool, Iodopropynyl Butylcarbamate, Butylphenyl Methylpropional, Hexyl Cinnamal, Limonene, Citronellol, Hydroxyisohexyl 3-Cyclohexene Carboxaldehyde, BHT.